Capacitor starting systems, such as the Micron PowerPak, were developed for the military to deliver a lot of power for short-duration loads, such as engine starting. Unlike batteries, capacitors are depleted quickly but also recharge in just 30 seconds. Imagine replacing a vessel’s starting battery with one that virtually never wears out and has virtually no self-discharge, one that produces no hydrogen gas and isn’t damaged if it’s left completely dead indefinitely, and this battery produces 2,500 cranking amps—several times what’s needed to start even a large diesel engine. Sound impossible? I thought so too until I encountered capacitor power packs about a decade ago. At that time, the technology was new, developed originally at the request of the Department of Defense for starting military vehicles. Several months ago the manufacturer of a capacitor starting system lent me one of its products, the Micron PowerPak. Weighing just 11 lbs (5 kg) and measuring 15“ x 7“ x 2.75“ (38cm x 18cm x 7cm), the unit packs an incredible punch for its size and weight. Because it utilizes capacitors rather than conventional lead acid, one of the PowerPak’s greatest attributes is its incredibly quick recharge time, on the order of just 30 seconds from dead to fully recharged. Using a controller and solenoid, supplied with the Power-Pak, the “system” (it’s not a battery) is wired to the vessel’s starting circuit, where it is designed to provide the starting current, allowing a conventional battery to “coast” along as it were, supplying other after-start, engine-running loads. 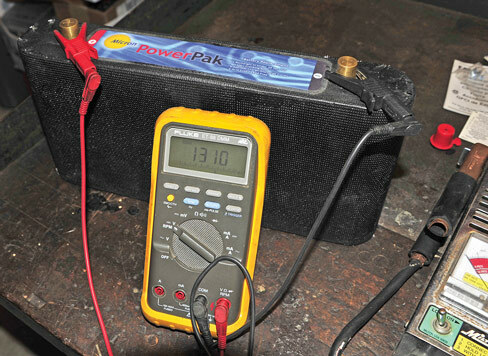 After the engine starts, the PowerPak recharges in about half a minute. It’s important to note, because it’s not a battery per se, the unit has practically no reserve capacity, so with any sustained load it will be depleted quickly. Its strength is in its ability to deliver a lot of power for short-duration loads, like starting. Because it’s new, I suspect the manufacturer hasn’t fully explored all of its possible marine applications; the literature and website are a bit rudimentary. However, the unit’s merits are clear: reliable power for cranking engines, no or low self-discharge, and a blindingly quick recharge cycle. The trial unit I tested, including the controller, costs $650, and is distributed by Outdoor Specialty Innovations, in California. Micron Corp., P.O. Box 370, Estill Springs, TN 37330, USA, tel. 931–461–7003, fax 931–461–1068, website www.microntn.com/powerpak.html.